The first Harry Potter novel hit bookshelves almost 20 years ago. A child born on the date the first book was published is old enough to vote now! Still, Harry has never gone out of style. 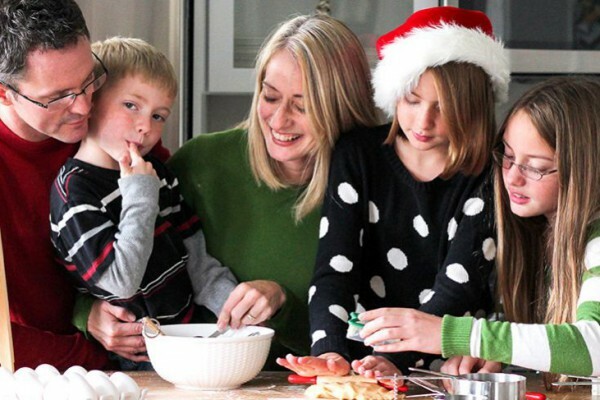 Through seven novels and even more films, the adventures of Harry and friends have captivated millions, and J.K. Rowling’s creation continues to be popular with children of all ages. 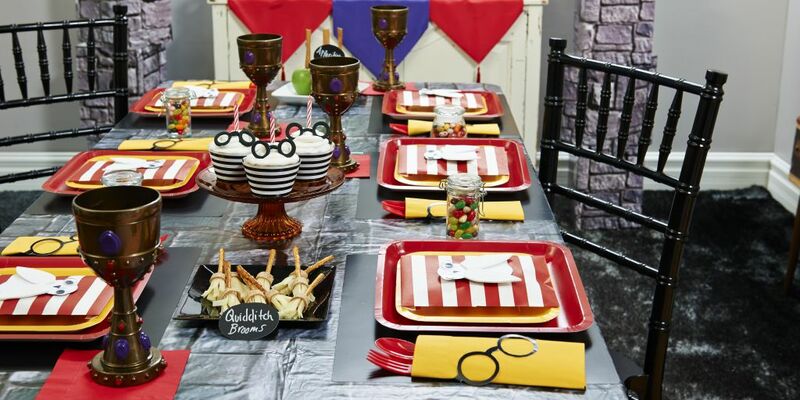 Chances are you even grew up with the stories of Hogwarts and have passed them on to your own children, and now that they are huge HP fans, they’re begging for a Harry Potter birthday party. 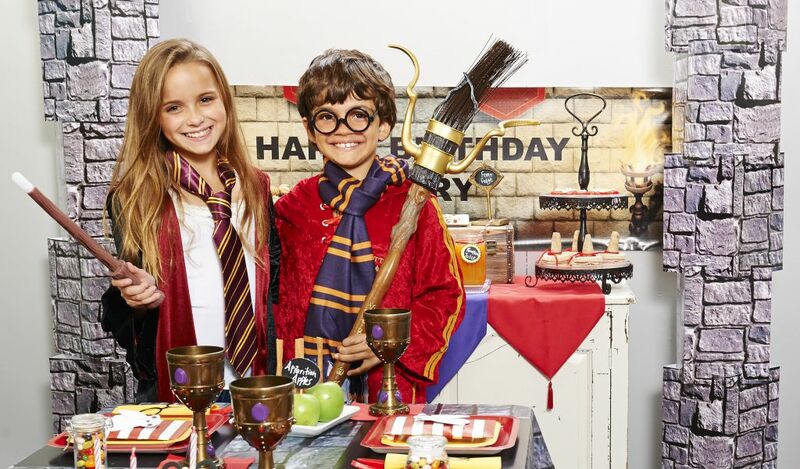 Lucky for you, BirthdayExpress has a new Harry Potter inspired party theme called Wizard School! For starters, to help your wizard of honor get into character, consider outfitting your little wizard in a Harry Potter costume! From a Hogwarts robe to a Quidditch uniform, from Magic Wands to Quidditch Broomsticks, we have you covered! 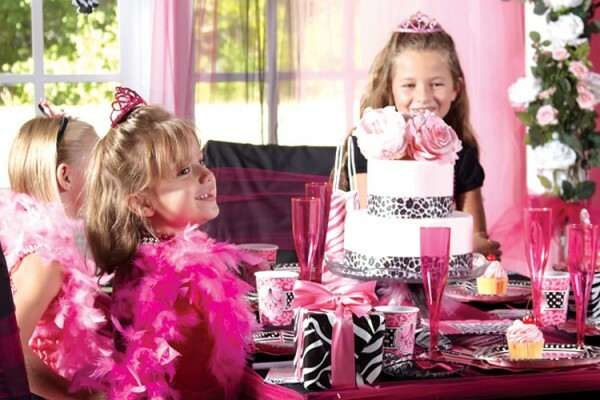 Check out the huge selection available from our sister site CostumeExpress.com! 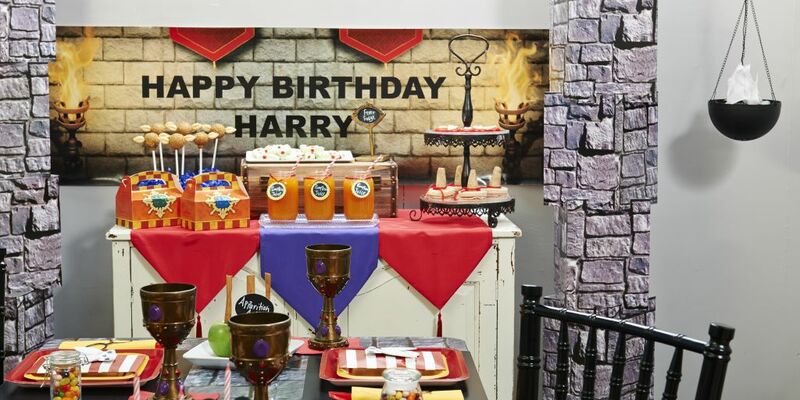 To set the scene for our Harry Potter inspired Wizard School, we used two of these very cool stone columns and an awesome vinyl birthday banner. One fun touch to help turn your dining room into the banquet hall of Hogwarts is to get these jeweled goblets as beverage cups. 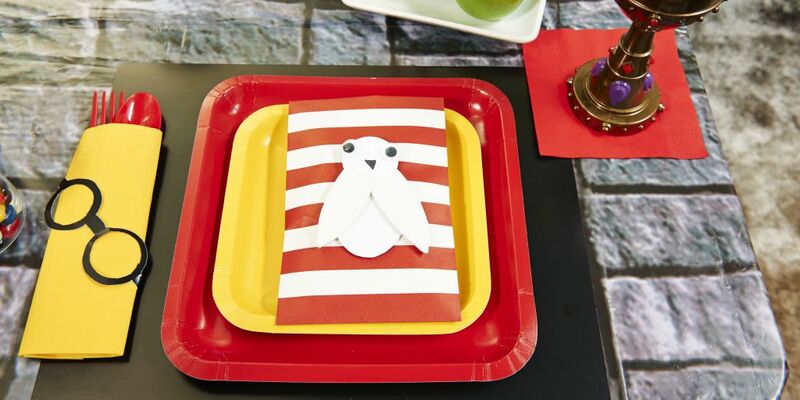 These Harry Potter glasses are cut out of our black placemats, and these mini-Hedwigs are made from scrapbook paper and a couple of googly eyes. They make great DIY additions to your Wizard School tableware. 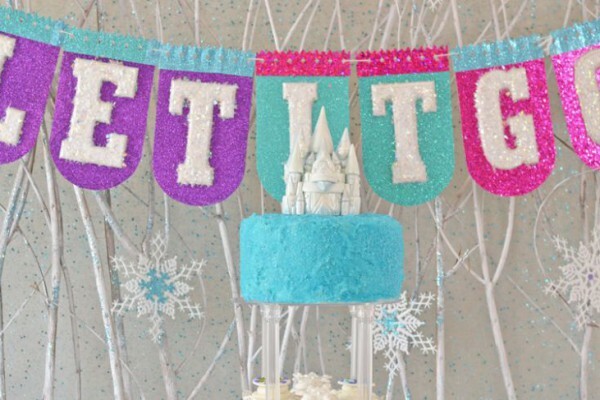 Before we get into all these delicious Harry Potter inspired treats and snacks, first consider getting the birthday wizard a personalized vinyl birthday banner. 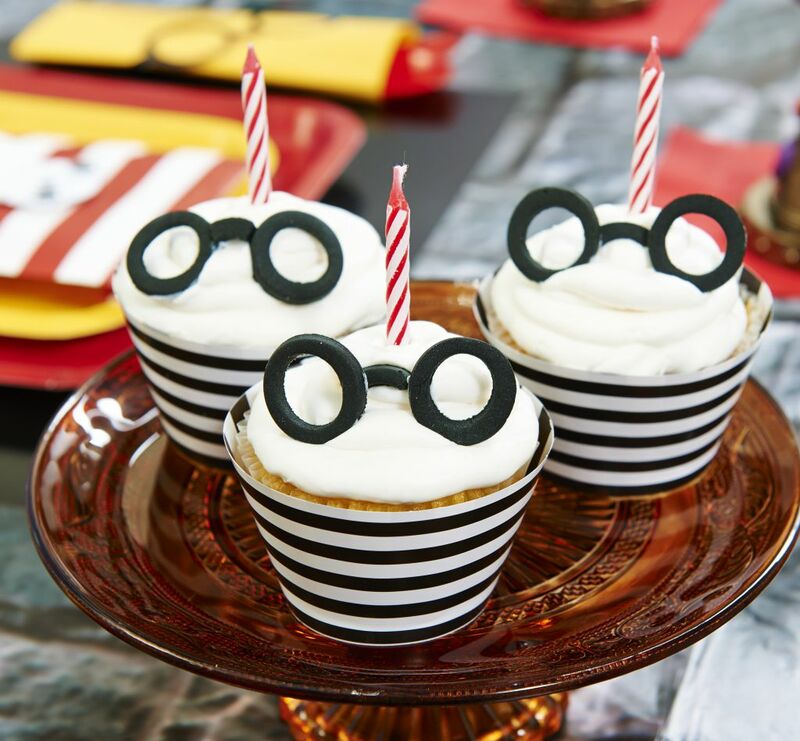 These Harry Potter cupcakes are topped with glasses cut from a sheet of craft store fondant, and nestled in these horizontal striped cupcake wrappers. 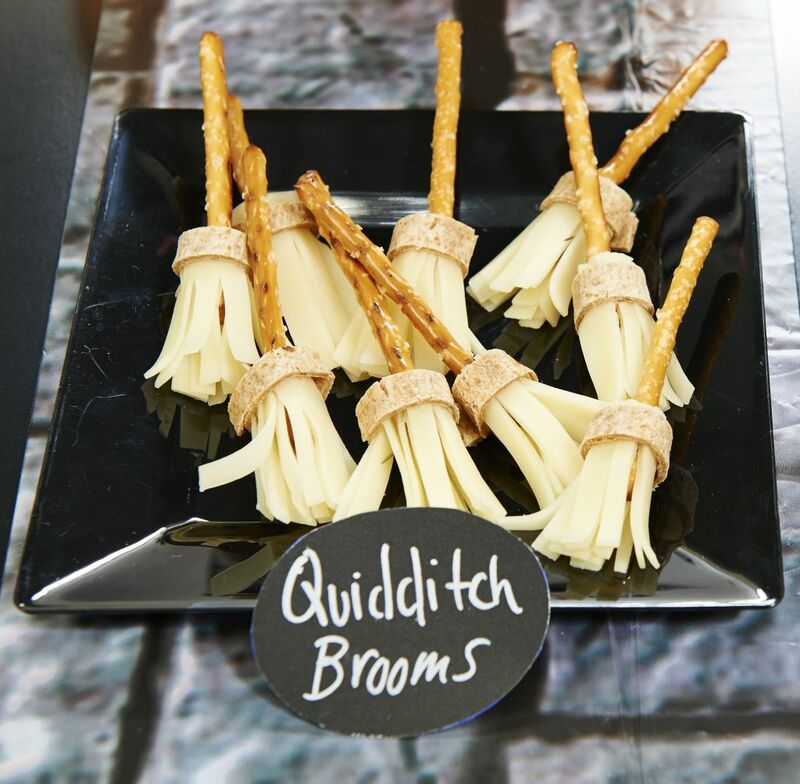 These Quidditch Brooms are made with pretzel sticks and fringed cheese slices attached with a dollop of cream cheese and a strip of wheat tortilla. Your Quidditch team’s Seeker can take the day off! 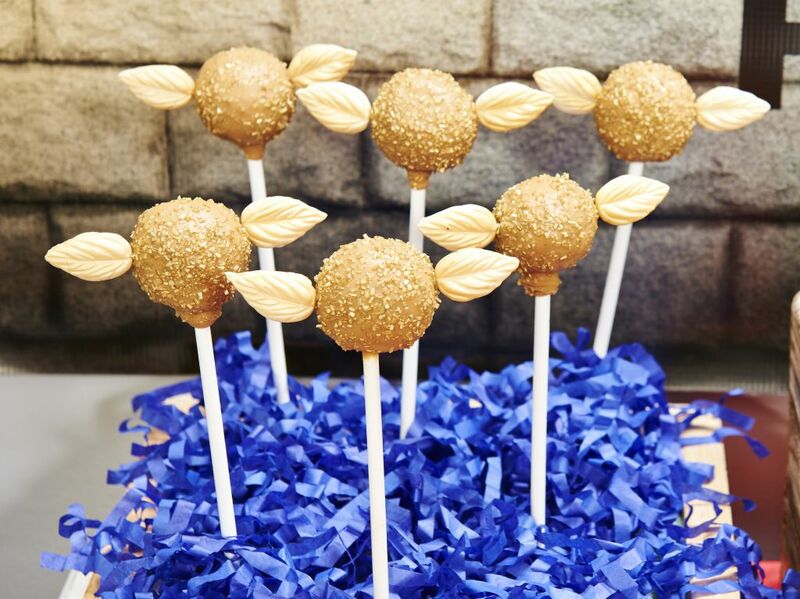 We’ve got the Golden Snitch right here, in the form of cake pops rolled in melted caramel candy melts and then dusted with gold sugar sprinkles. The “wings” are made of fondant, found in the baking aisle of the local craft store. 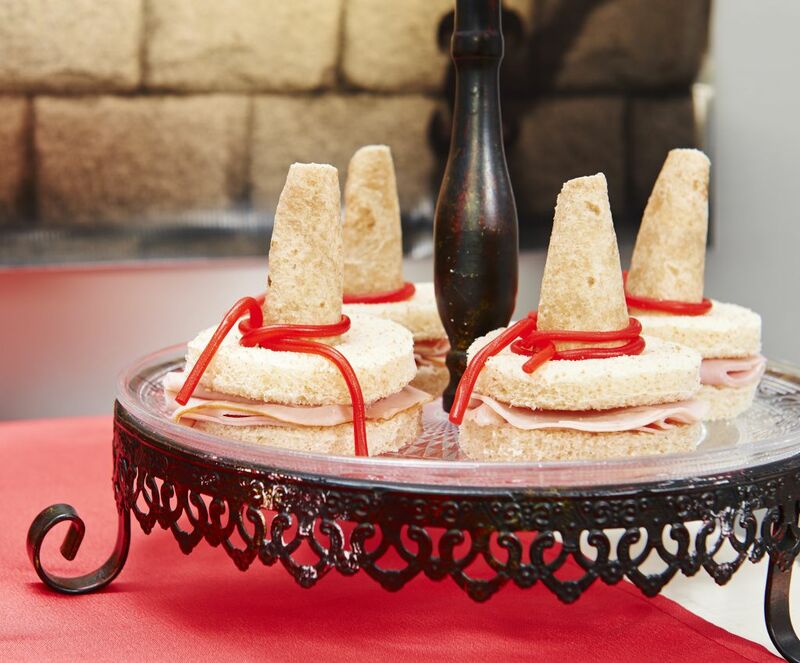 These Sorting Hat snacks are made with circles of wheat bread cut out with a cookie cutter, sandwiched around slices of lunch meat and cheese. The cones on top are rolls of wheat tortilla and they are tied with a string of red vine licorice. As everyone knows, the ingenious Weasley brothers invented Fever Fudge to get out of going to class. Our recipe won’t make you run a temperature, but it sure is tasty! 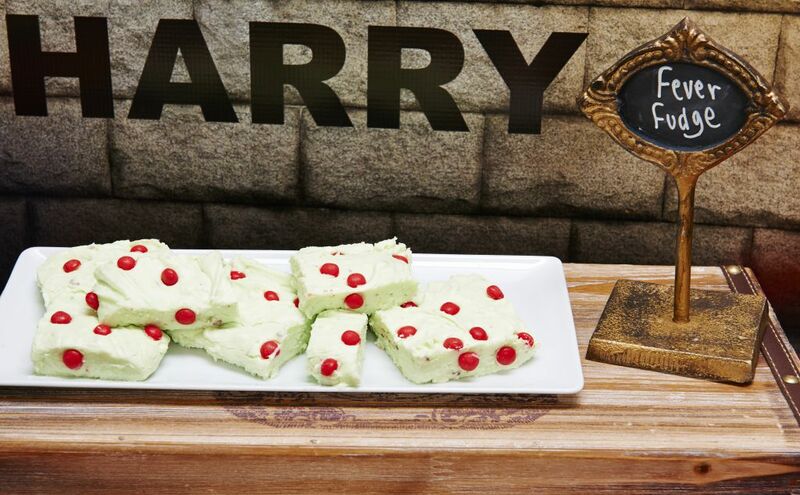 It’s made from peppermint fudge, with mini red hot candies added before the fudge has had time to fully set. 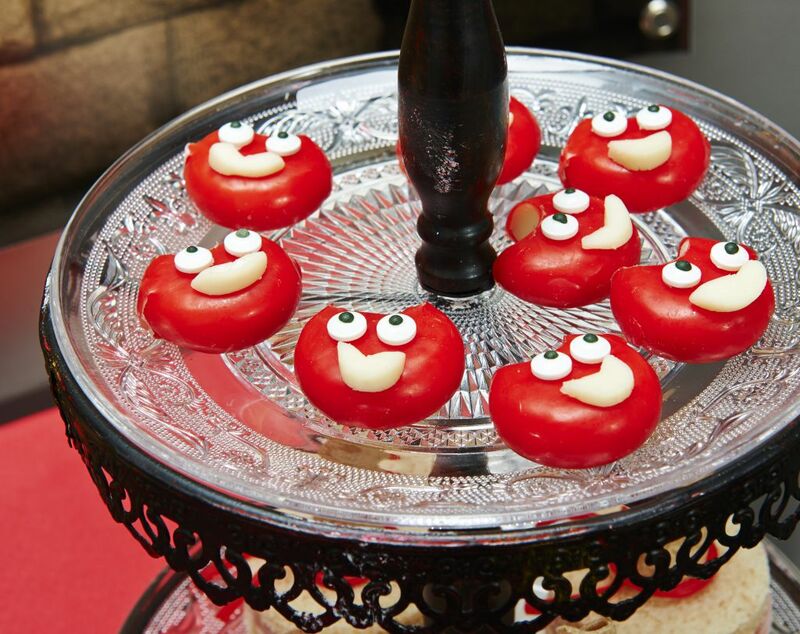 These little mini-Hedwigs are just Babybel cheeses with a notch cut out to create an owl’s head. We used the removed cheese to make the beak and little candy eyes from the local craft store. Adorable! 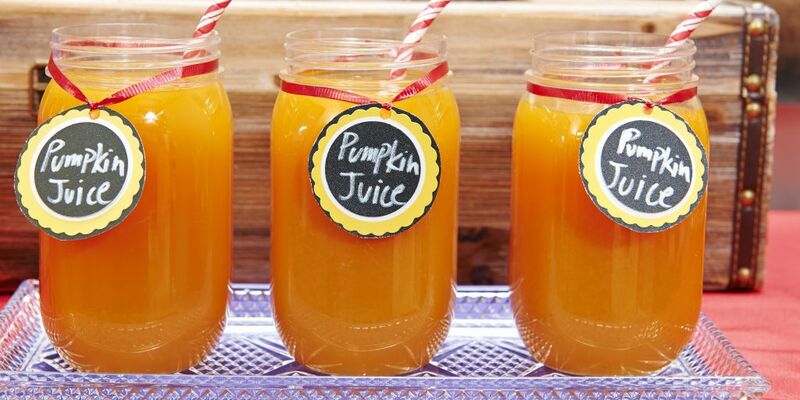 Pumpkin Juice is the beverage of choice for young wizards everywhere. We substituted Peach Mango juice for the real stuff. It tastes better. 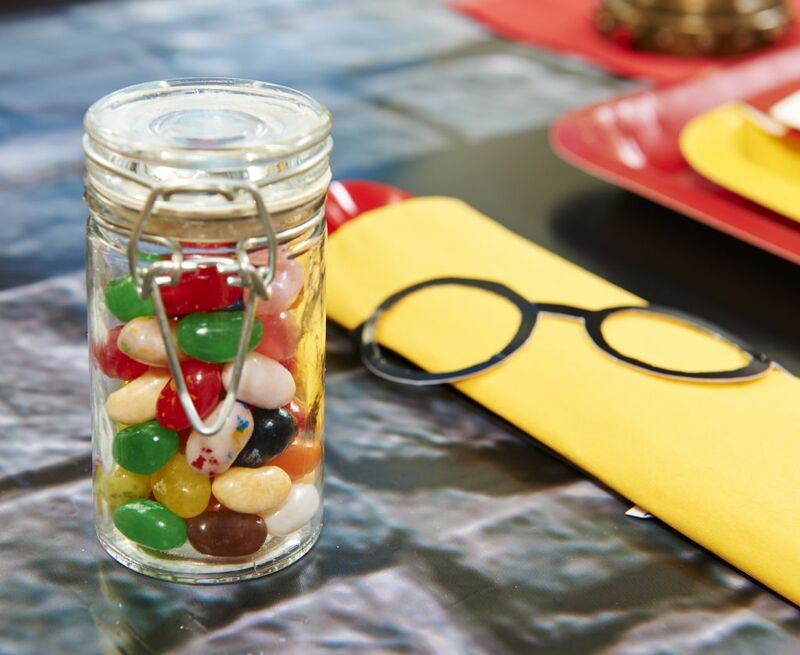 Can’t have a Harry Potter party without Bertie Bott’s Jelly Beans! Any party without a pinata just can’t be considered magical. 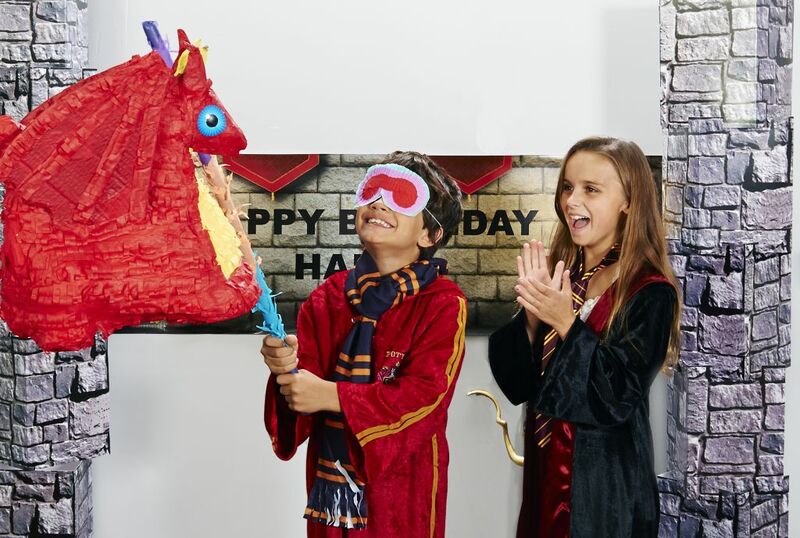 Lucky for your little wizards we have this dragon pinata, and instead of breathing fire, it drops candy! 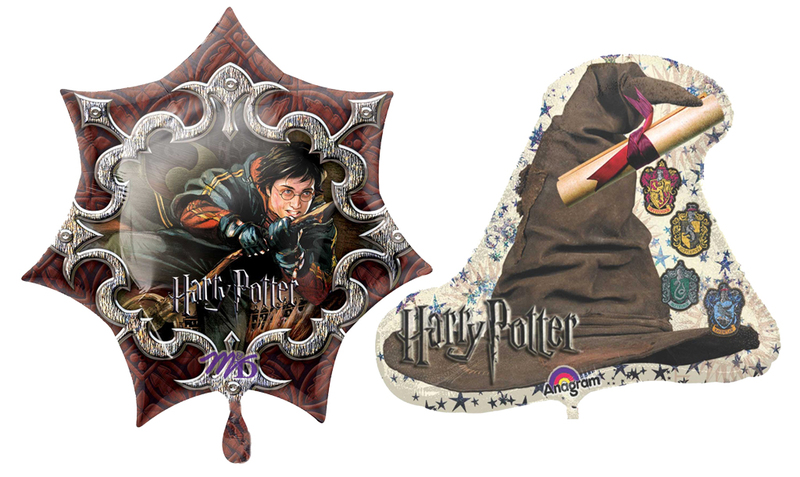 If you’re looking for Harry Potter themed balloons, we have a foil star balloon featuring Harry playing Quidditch and one featuring the all-important Sorting Hat! 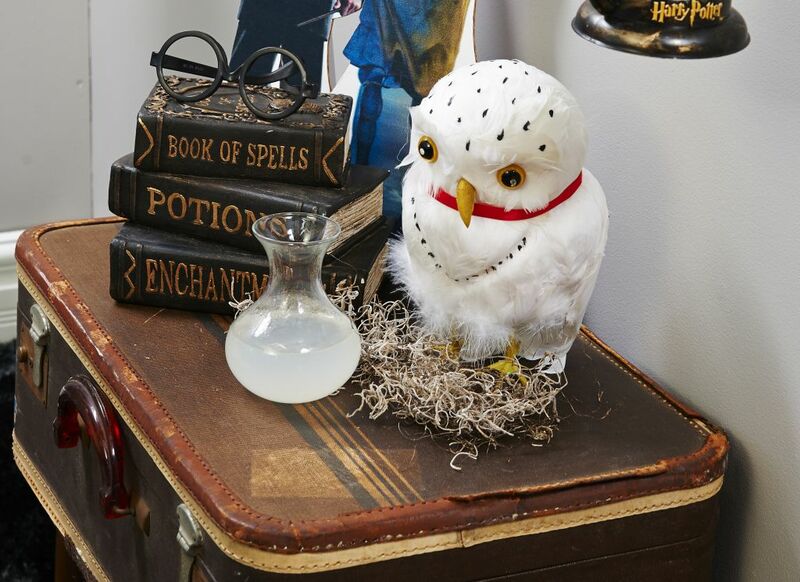 This stuffed Hedwig decoration is perfect for side tables or as a centerpiece. 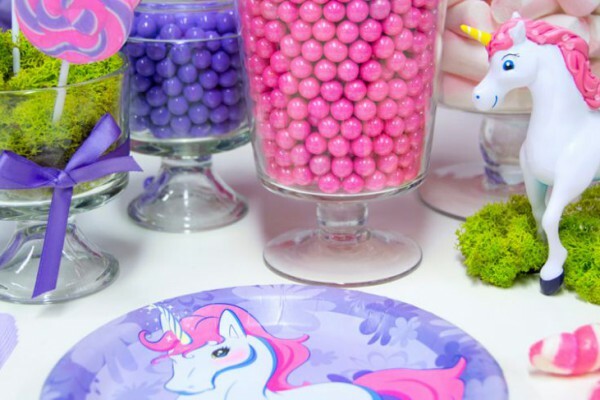 Plus, it can go in the birthday Wizard’s room when the party is finished! A little gold paint on some old books from a flea market turns them into books of spells, and some lemonade in a curved vase becomes a magic potion pretty easily! 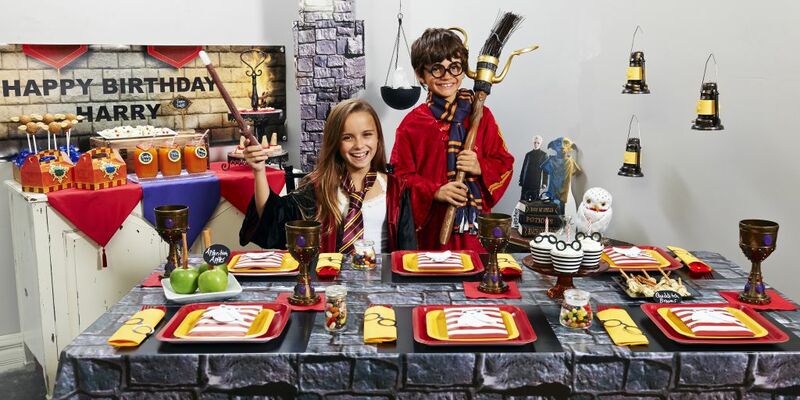 To help your wizard of honor get into character, we have a whole bunch of Harry Potter costumes and accessories available from our sister site CostumeExpress.com! Once everyone is in costume, have your guests pose with these cardboard stand-ups and send the pictures out with your Thank You notes. We have a stand up with Dumbledore and one with Harry, Ron and Hermione! 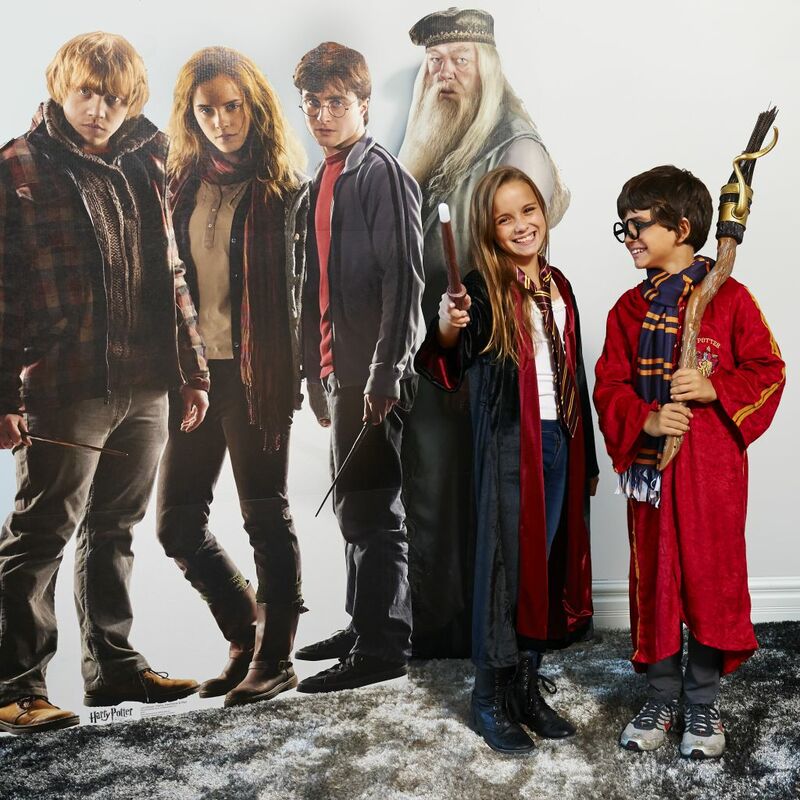 We hope your little wizard loves their Harry Potter party as much as our Harry and Hermione loved theirs! 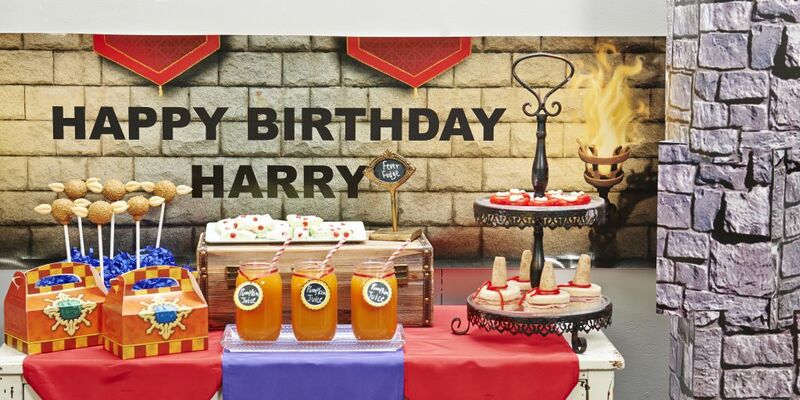 Have we inspired you to throw a totally magical Harry Potter inspired birthday party? Which theme should we feature next? If you enjoyed this post and want to see more like it, then follow us on Twitter and Facebook, and tell us what you think! Check out our Pinterest boards for more great ideas, too! Click here to view the entire Diva Zebra collection.